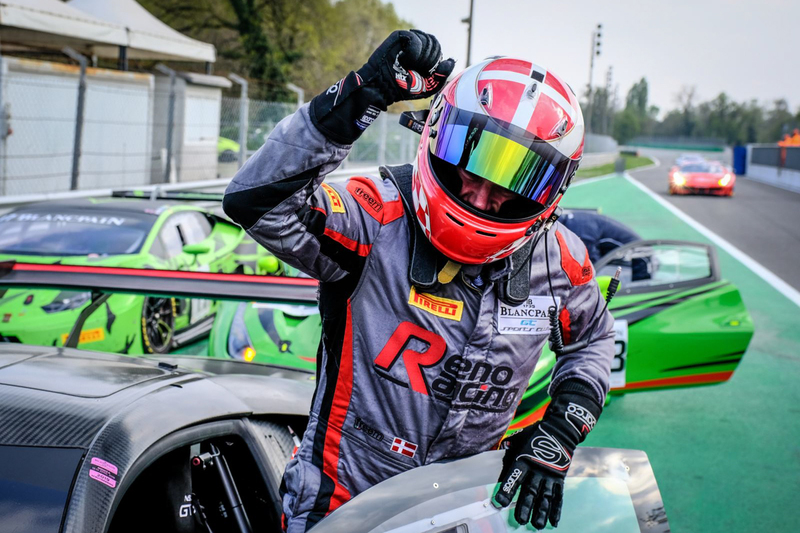 Jens Reno Moller dominates to win Blancpain GT Sports Club opener at Monza. Having topped every Saturday session in the Blancpain GT Sports Club opener at Monza, Reno Racing’s Jens Reno Moller streaked clear of his opposition to take a commanding victory, the first in any competition for the new Honda NSX GT3 Evo. In the Titanium Cup class, HP Racing International’s Coach McKansy came out on top despite a late charge by Rinaldi Racing’s Vadim Kogay. Stephen Earle got off to a winning start in the Iron Cup class, beating his nearest rival by over 10 seconds in the #111 Kessel Racing Ferrari 488 GT3. After qualifying on pole, Møller quickly pulled a gap to AF Corse’s Mario Cordoni on the first lap, building an advantage over the #51 Ferrari 488 GT3 driver over the course of the 30-minute race without putting a wheel wrong. Cordoni also extended a gap to the battling cars behind, which included McKansy, Kessel Racing’s Murad Sultanov and StileF Squadra Corse’s Pavel Strukov, eventually coming home in second place, his third podium at Monza. Debutant Strukov occupied third spot for much of the race, but as the laps wore on so to did the Russian’s tyres, and soon McKansy reeled in the #777 Ferrari. Strukov then went wide at the second Lesmo, before spinning at the Parabolica, dropping him outside the top-10. McKansy and Sultanov then engaged in an epic battle for the final podium spot, with the #23 Ferrari driver taking advantage of the German’s error in the first chicane to slot into third place. This allowed the #333 Ferrari of Kogay to close the gap, but the Russian couldn’t quite get past his Titanium Cup rival, with the two separated by just 0.767 seconds across the line. Further back, Earle enjoyed a smooth race, taking advantage of those ahead whilst running a strong pace to finish sixth overall and first of the Iron Cup runners, ahead of Gerard van der Horst. The #98 Lamborghini Huracan Evo driver spent much of the race around two seconds adrift of the experienced American, holding off Lee Mowle in the #44 Mercedes-AMG GT3 to take seventh and the final step of the Titanium Cup podium. Mowle made a good start and was battling with Kogay earlier in the race, getting by his Titanium Cup rival before the two outbraked themselves at the chicane. The British GT convert lost a large chunk of time, but recovered to finish eighth. HB Racing’s Dilantha Malagamuwa was next in the #24 Lamborghini Huracan, finishing just ahead of Iron Cup driver Rick Peter Lovat, who scored an overall top-10 finish on his maiden appearance. Rounding out the Iron Cup podium was #50 AF Corse driver Louis Philippe Soenen, who finished ahead of Attempto Racing’s Bernd Kleinbach, AF Corse’s Kenji Abe and GDL Racing’s Roberto Rayneri. Next for the Blancpain GT Sports Club drivers is the second and final race of the Monza weekend, which will be live streamed on the website, YouTube channel and Facebook page. Reno Racing’s Jens Reno Moller made it two from two on his Blancpain GT Sports Club debut at Monza, with a controlled victory in wet conditions on board the #11 Honda NSX GT3 Evo ahead of Kessel Racing’s Murad Sultanov. Sultanov sought about closing the gap to Møller on the final tour, but the Dane had enough in hand to take his second victory of the weekend, with the Kessel Racing driver coming home 3.636 seconds back. Mowle completed the overall podium in third, scoring his first Titanium Cup victory ahead of the #17 Lamborghini Huracan GT3 of Coach McKansy. The German initially dropped back to sixth, but completed an error-free race to finish fourth on the road and second in class.